Here is a recipe that my mom made over the holidays. 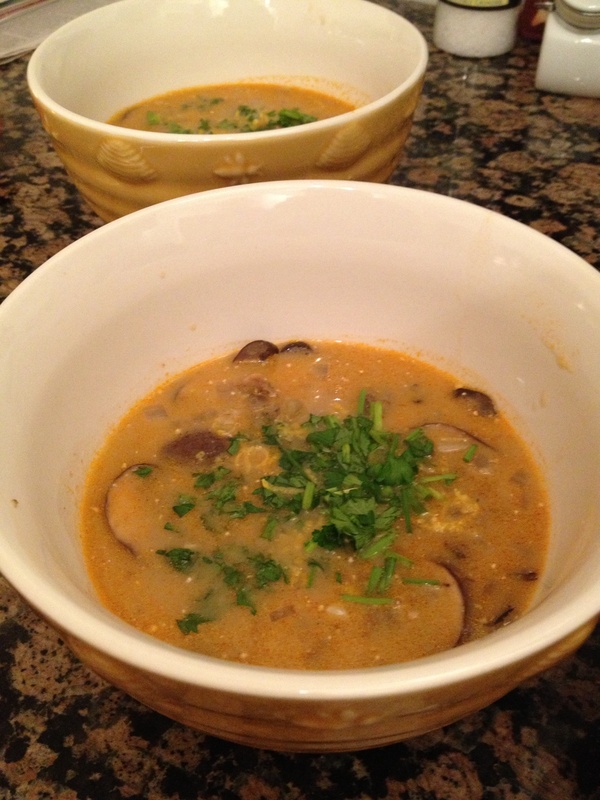 It is often hard to find soup that is gluten and dairy free, but she did it! It was a great appetizer to our holiday meal, and served as great leftovers whenever we wanted a snack later on in the week. I know that it looks long, but well worth the effort! My mom and I were amazed at the idea to grind up dried mushrooms and use them as a spice in the soup..genius! Grind dried mushrooms in spice grinder or coffee bean grinder to a powder, or reconstitute in ¼ cup warm water until soft and finely mince. Bring 4 cups water, thyme sprig, bay leaf, peeled garlic clove, ¾ teaspoon salt and ¼ teaspoon baking soda to a boil in medium saucepan. Add wild rice and return to boil. Cover and place in oven. Bake until tender, @45 minutes. Strain rice through fine mesh strainer set in 4 cup measuring cup. Discard thyme sprig, bay leaf and garlic. Add enough water to strained liquid to measure 3 cups. Melt butter in Dutch oven. Add cremini or white mushrooms, onion, minced garlic, tomato paste, ¾ teaspoon salt and 1 teaspoon pepper. Cook until vegetables are browned, stirring occasionally, about 15 minutes. Add sherry, scraping up browned frond on bottom of pot. Cook until almost reduced, about 2 minutes. Add ground or reconstituted shiitake mushrooms, reserved rice liquid, chicken broth and soy sauce. Bring to boil, and then reduce heat and simmer, covered, until mushrooms and onions are tender, about 20 minutes. Whisk cornstarch and ¼ cup water in small bowl. Simmer soup until thickened, about 2 minutes. Remove pot from heat, stir in rice, coconut creamer, chives, lemon zest and salt&pepper to taste. Cover and let stand 20 minutes before serving. 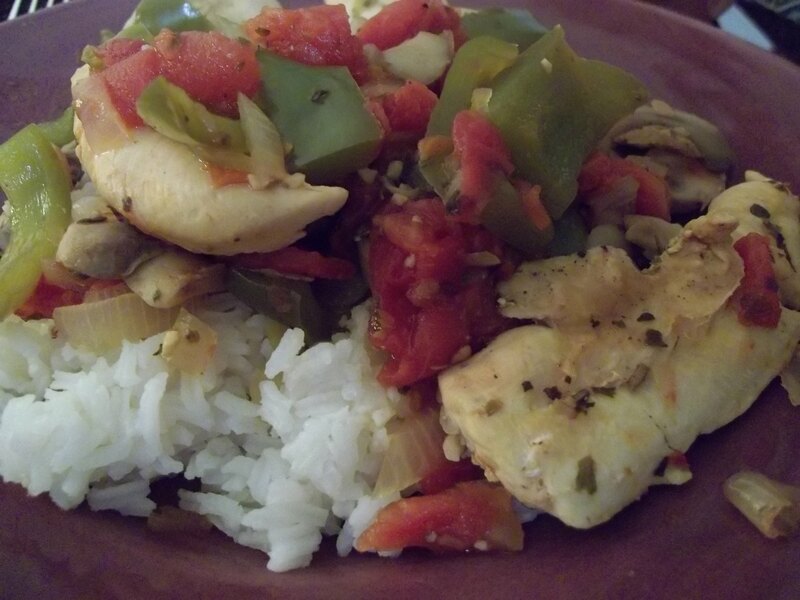 When I graduated college and money was tight on a first year teacher’s salary, I got pretty good at making easy and cheap chicken dishes. Whatever was on sale was what I made. Apparently one of them, Chicken Cacciatore, was good enough for my roommate Caitlin to ask for repeatedly during the three years we lived together. So, Caitlin… this one is for you! Easy, cheap, and perfectly gluten and dairy free! In a large coated saute pan, add the chicken tenderloins. Cook for a few minutes on each side, enough to sear each side, but not cook completely through. In a different saute pan, add the olive oil, green peppers, and onion and cook until tender. In the chicken pan, add the peppers and onion. Also add the diced tomatoes, mushrooms, and spices. Cook on medium heat, covered, until cooked through and all ingredients are tender (about 10-15 minutes).